Teams are rapidly replacing traditional SharePoint workspaces. If and when this happens, we need a tool for end-users to order different teams for different purposes. And all of this without writing a single line of code! 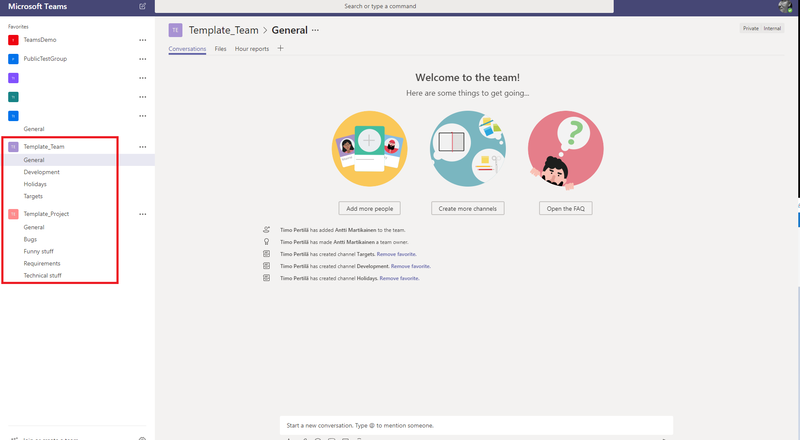 We create two new teams (Template_Team and Template_Project) which will act as templates. Let's make the following changes to them. Template owners are always copied to a new team. Don't be worried, they can be automatically removed during the process. We need a place where to store all team requests. SharePoint list is an excellent choice for that. Let's create a one with the following columns. We need also another list having information about used team templates (name and id). Wait a minute, where i can find those team id's? You can always use Microsoft's excellent Graph Explorer. Sign in with your account and execute joined teamsquery. From the response, you find all the teams you have been joined (also those two templates we just created). From there you can find also that team id we are looking for. How end users start the provisioning process? With PowerApps of course! 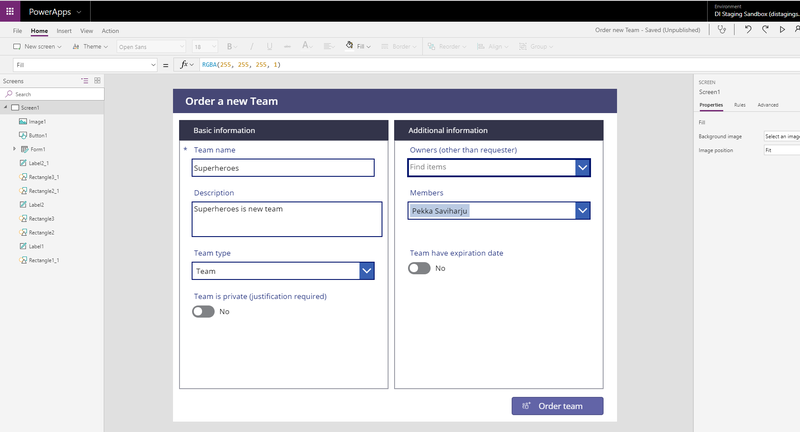 Just create an empty PowerApps and add the form on it. Attach the form to the SharePoint list we just created. After quick restructuring, our PowerApps looks like this. I skip the details (this is not a PowerApps community) but after a few minutes of cleaning and building some logic to the form fields PowerApps looks like this. If you are not familiar with PowerApps, don't stop here. 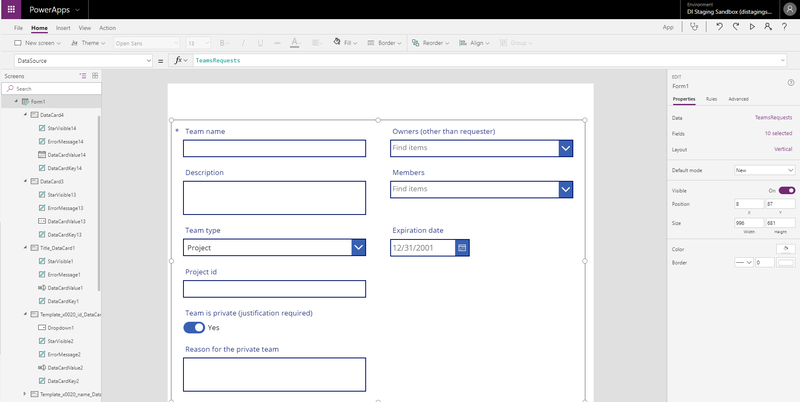 You can skip PowerApps part and start with manually entering requests on the SharePoint list. Let's make a few requests with PowerApps. Seems to be working. Now we can start the hard part of this exercise. 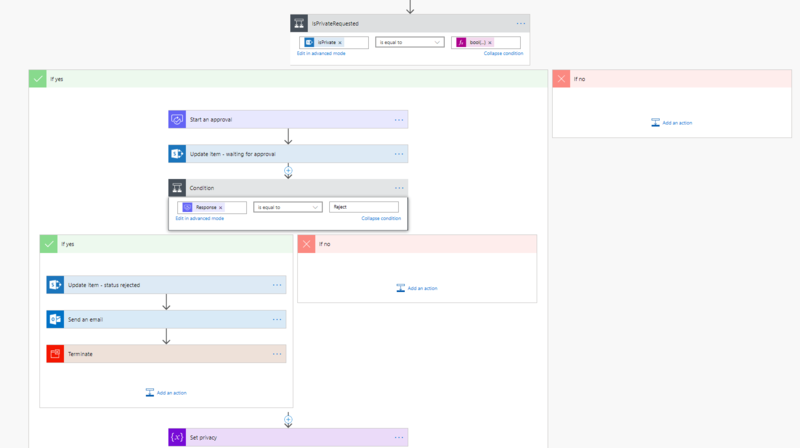 We will use Microsft Graph API in our Flow for creating and updating teams. For that, we have to somehow authenticate our REST API calls. 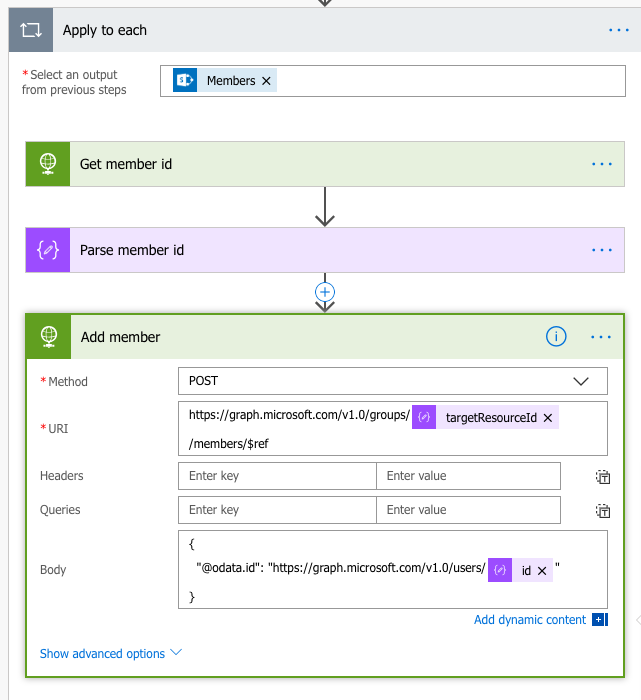 This can be easily done by using Azure AD Application. 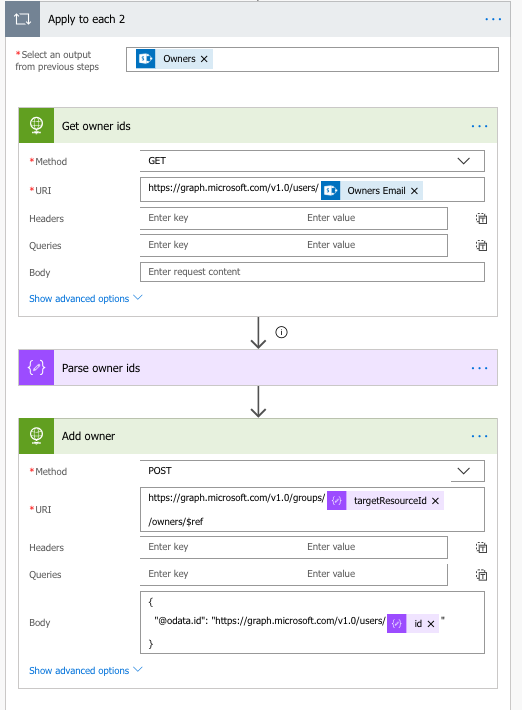 First, we need to create a new Application in Azure AD (Azure Active Directory -> App registrations -> New application registration ). 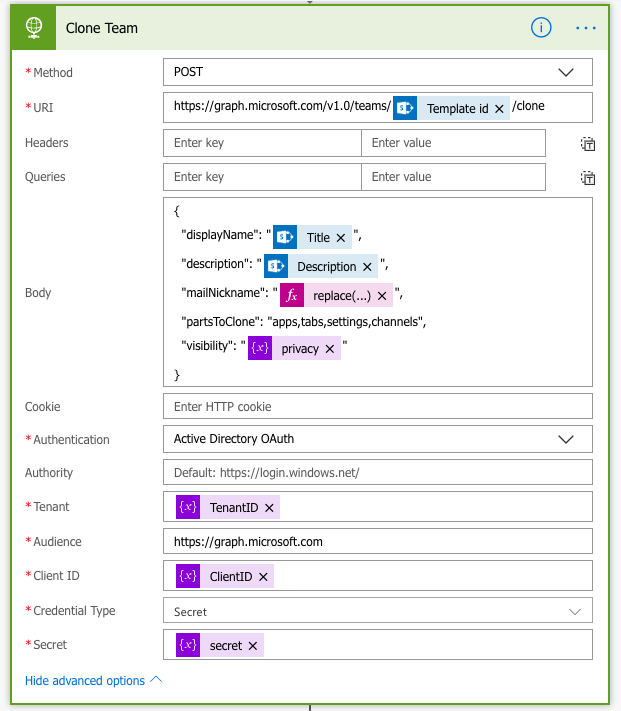 After that we have to require permissions for the Application (Settings -> Required permissions -> Add - > Microsoft Graph). Names are of course different from those used in the Microsoft documentation (above). No worries, they still can be found there. Finally, the Administrator must approve the requested rights. Usually, you can't do this by yourself but we you have to ask an administrator to grant permissions. This time I can perform self-acceptance. Then we create a secret. The key of the secret and application id are the pair we use in authenticating. We need also Tenant id. 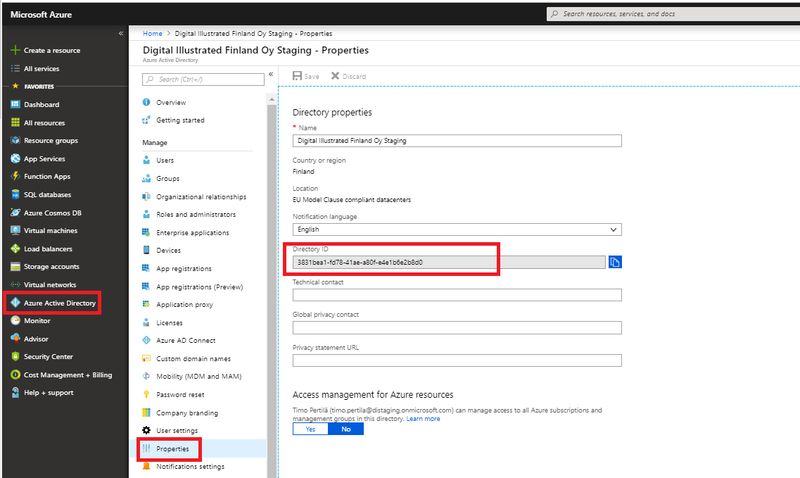 It can be found, for example, in Azure Ad properties (directory id). Azure AD part is ready. We can move on to build the actual workflow. 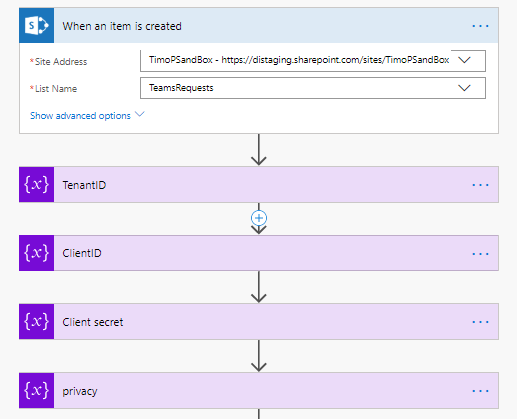 The new team is created with Flow starting every time when a new item is created on our request list. And one extra variable to store the privacy setting of the team. The default value for it is "Public". If the user has requested a private team, we start an approval process. Update the request status to "waiting for approval"
Update the request status to "fail"
The process above is skipped entirely if the requested team will be public. Next, we create the requested team. In fact, we create a copy of the matching team template. This is done in a very simple HTTP call. In the body, there is all needed information in place. However, the team will be not created immediately. This will cause a little bit more effort because we are not finished yet. The aim is to add more owners and members to the team. 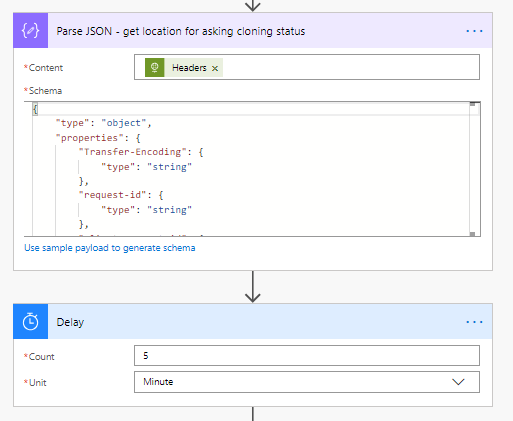 After the REST API call, we add Parse JSON function. It makes easier to handle all the information the REST API call returns. Among the returned fields we found location. It is URL address from where we can ask whether a team is ready and what GUID it has. Nex we just wait for 5 minutes before we continue. Actually, we should build a loop for polling team creation status. Maybe next time. Now the team has been created. 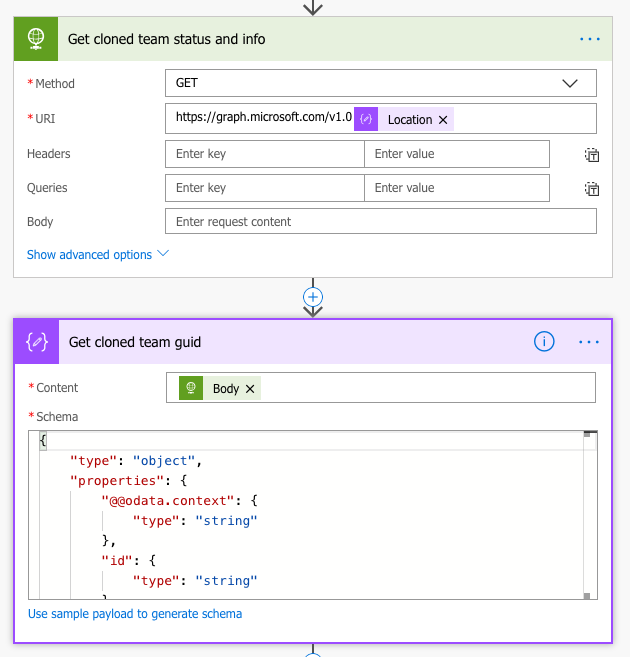 Next, we get (with Microsoft Graph and Parse JSON) GUID for the created team. At last, we can finalize the team we have created. We add requester as an owner for the team. For that, we need the id of requester user account. This is done with Microsoft Graph API (of course). After that, we can add the user to the owners group. In the same way, we add other owners (requester listed in the request form). This starts to be a little bit boring. Members (requester listed in the form) are added exactly the same way than owners. The only small difference is in the URL we use. Word "owners" is replaced with "members". The new team has the same owners than the team where it has been cloned from. We want to remove those ones. 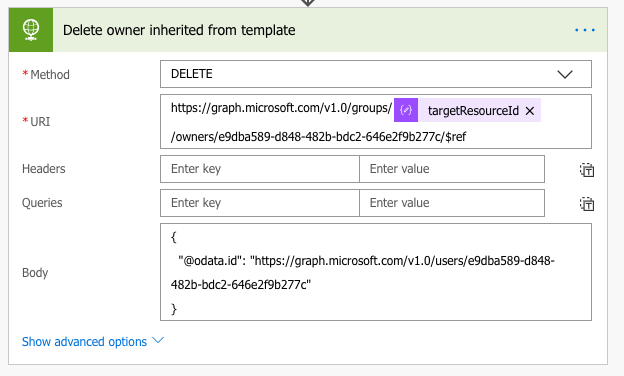 Hardly comes as a surprise that this is done by REST API call to the Microsoft Graph. Our solution can be used as a base for the provisioning solution. It can create different teams according to what the user has requested. It also can add owners and members of the created team. Clone function is pretty handy. It makes easier to understand what templates actually looks like. An alternative way is to build the whole team from the scratch (add channels, change settings, add apps etc) in the Flow. This is a great idea and implementation. I'm sharing it with my team and looking forward to trying it out with some of my customers. I really wish some more details about a few steps were provide. For example - How are you parsing the JSON? I see the first few lines but that does not give me all the steps to grab the GUID from the returned JSON. After researching this a bit it looks like you ran the scripts one to generate the returned JSON then pasted that into the "Use Sample Payload to generate schema" which then allows you to parse the JSON that is returned more easily. Yes Berny, just like you wrote. Parse JSON is super handy. First just run action that outputs JSON. Copy the output and give it to Parse JSON as an example (Use Sample Payload to generate schema). This works very well. If the JSON is very complicated, then you might like/have to write a schema by yourself. Great article and I will be using it is a base for the solution I am developing. One request though. Would you be OK with exporting the flow and sharing? It would definitely speed up my development time if I got an actual flow example to import and work with. @TimoPertila - Thanks for sharing. It will be a great help. Happy New Year! 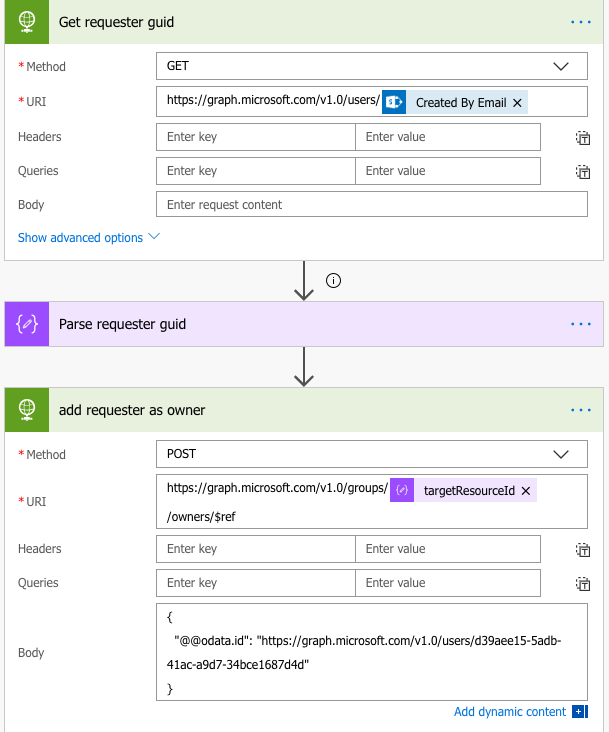 I create MS Team using Custom Connector and flow, Authentication with MS Teams connector on Azure AD would require the global admin password to be fed in each time you log in, can you please tell me what i do that they do not ask again and again for global admin password. Thanks for nice post. It helps me a lot. How can we parse response header of HTTP call? It does not return JSON format, so I can not get TeamId from header. I can pars output of the clone operation (in header) with using PARSE JSON action. Tricky part might be to get example output that you can use with PARSE JSON action. After the clone you get that "location" from where you can ask if the team is allready cloned or not. When asking status, you get id as a part of response. We have managed to get Teams, channels and its settings to clone. however the tabs and apps are not showing for us (We are trying to use MS Planner in a tab). Did you manage to get yours to show and if you did, do you advise any sort of work around we could try? We have tried changing permissions from app to delegate, tried using the planner api using the HTTP flow, however no luck. Actually I didn't manage to clone tabs ( I used Application level permission in my excercise). But I have told that it works when using Delegated permissions. Some of those are not needed for this case, but you can drop them out one by one after you managed to create those tabs and apps. And try also beta endpoint aso. This acrticle is very good and just what i needed. I tried eveyrthing now but im stuck at the Clone Team part. @JimmyWork have you tried calling that graph method with the Graph explorer? it is a Beta endpoint and may still have issues. Does not work from Graph Explorer. If i only type in tabs in partsToClone i get this message. Just to be sure. Are you using beta or prod (V1.0) endpoints on your rest api calls? Im actually using the flow you posted to download. It seems that when i add apps in the cloning part of the body it will produce the error and i cannot clone without adding the apps so i really dont know why its not working. Not even in graph explorer. Can it be something with my team template? I created a new Team and took the id of this. Im really thankfull for all the help here. I solved it, for this to work now i have to remove "classification": ""
I downloaded your flow and edited to best of knowledge. At the apply to each new owner and same for member part i dont have access to the sharepoint columns as an option. So my Owners column is not available for me to pick. Nice that you solved the cloning issue! I am sorry if there were some beta endpoints used in my downloadable version of Flow. Beta is always beta and I had all kind of issues with beta endpoint. I had also issues with service level permissions. Delegated permissions worked at the time blog post was written much better. Does the owners column allow multivalues in your SharePoint list? First i would like to say thanks again. This flow is just amazing. And thank you for answering me. Im pretty sure i have not set allow multiple selections in the column so this is the first thing i will do on monday. I dont have access to the account until then. It was the columns i needed to change according to your info. Im having one small issue, i downloaded your flow. The last part, "Apply to each new owner"
If i create the Item i will be made into an Owner, if i then in the list as Owners also add myself it will conflict with the "Apply to each new owner" because im already added, this is logic. But in my situation this will happen alot from users and i wonder what i need to add to check if owner or members is already added skip and move forward in flow. As allways, there are different ways to handle this. Just pick one. - When adding owner in "Apply to each new owner" check if the current owner to add is same than requester. If it is, just skip it.